Preserving food by drying it was practiced in this country centuries before Columbus. The methods are easy, dependable, and do not require on intensive heat source. The nutrition of the food is preserved and NO chemicals are needed. All you need are heat and a free air flow. The summer sun and woven racks of dry wood will do. The heat can be focused and intensified using flat, dry, dark materials such as slate. 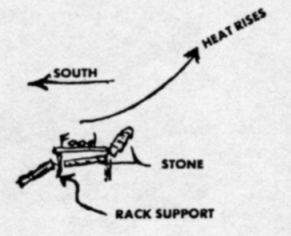 The food racks should be two inches above the slate. From The Tracker magazine, May 1982, published by the Tracker School.